Since the 2013 release of their first single “Wild Heart”, The Vamps have been climbing their way up the music charts. Their debut album Meet The Vamps showed great success in countries around the world, allowing them to tour with acts such as Austin Mahone, Fifth Harmony and Selena Gomez! Throughout 2014 and 2015 they headlined in venues around the world, including an arena tour in the UK where they performed at the O2 Arena twice! 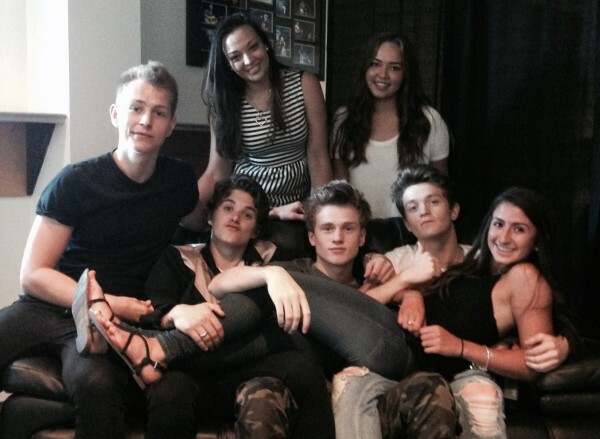 Jessica, Holly, and Daniella snapped a picture with The Vamps after their interview at Big Ticket Summer! On September 15th The Vamps released multiple exciting announcements about what to expect for the rest of 2015 (for a breakdown on all The Vamps news check out this article). The highly anticipated single “Wake Up” will be released October 2, but has already reached charts on iTunes around the world on pre-orders alone! The Vamps new album will be a true reflection of their musical maturity and talent. November 27 can’t come soon enough! Tune into Family Channel on September 25th at 7:30pm et/pt to see The Tide perform live while on The Big Ticket Summer concert tour.